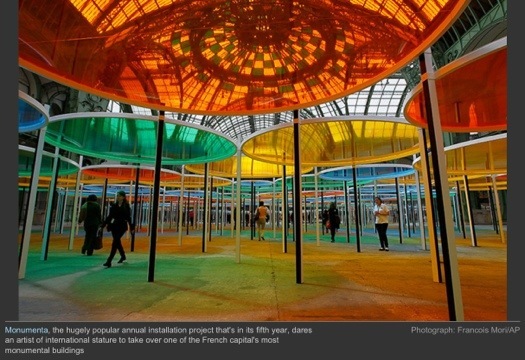 French conceptual artist Daniel Buren is the fifth artist to take over the Grand Palais in Paris. His offering is Excentrique(s), a giant kaleidoscope-style installation that fills the building’s nave. The 2012 Monumenta site-specific commission in the vast, airy nave of Paris’s Grand Palais is like being plunged into a pool of coloured light. Daniel Buren is the fifth artist to take on the annual Monumenta project in the belle epoch Grand Palais, originally built for the 1900 World Fair. It is a far more daunting site than Tate Modern’s Turbine Hall. If the scale doesn’t get to you, the architecture does. A canopy of hundreds of horizontal circles, each touching the next, some larger, some smaller, some a little higher, some lower, fill the space. Each open steel O is stretched with a membrane of translucent plastic film, either in blue, yellow, orange or green. These are supported by black and white vertical posts, so many that they become a forest, half-drowned in colour and shadow.